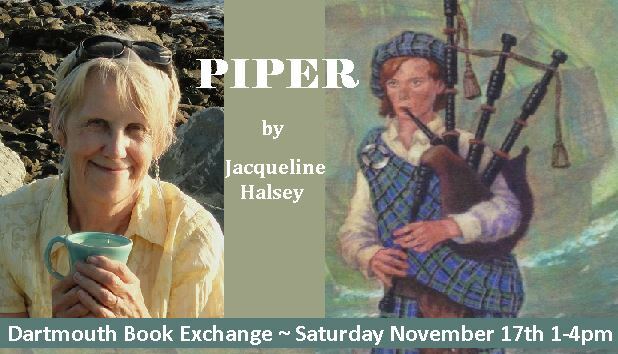 Dartmouth Book Exchange is pleased to welcome Local Children’s Author, Jacqueline Halsey and her latest book “Piper”, a chapter book for ages 8-12. Piper, takes place aboard the Hector, a ship that brought Scottish Immigrants to Nova Scotia in the 18th Century. Released in May of this year by Nimbus Publishing, it is just one of several books Jacqueline has had published. We are so excited to host this event at Dartmouth Book Exchange, providing an opportunity for our community to come and meet this amazing Local Author. It’s 1773 and twelve-year-old Dougal Cameron and his whole family are set to sail away from their Scotland home forever. When tragedy strikes, the family must decide whether or not to make the trip without Dougal’s father. Once the ship departs, Dougal is drawn to the haunting sounds of the lone piper on board. (The instrument, while still illegal in their homeland at the time, was brought aboard to keep spirits up.) When a violent storm knocks the Hector two weeks off course, Dougal’s dream of becoming a piper has to take a back seat to keeping his three little sisters alive. Jacqueline will be signing copies of her book, which will be available for purchase from her- cash only.